A loan of $7,000 helped this couple build a sustainable healing sanctuary with clean food and self-grown herbs inspired by the tea villages of Myanmar. I have previously been a warehouse manager, builder, semi pro skateboarder, landscaper and small business owner, I am currently working part time as a welder for my local recycling center. I moved to Nehalem, Oregon to restart my life in 2012 to live with my amazing girlfriend, Farmer Ginger. I was in search of a peaceful place to find my purpose, while escaping the fast life of Portland. in 2014, after returning from a trip to Myanmar where we journeyed to a mountain top tea village, I got the honor of marrying Ginger. During these years, I've attended herbal school (Vital Ways & The School of Forest Medicine) to learn about the human body and beneficial herbal remedies for teas & health. I've met many of the great elders who reside here, who have taught me plant medicine, herbalism, tai chi, fire science, homesteading, meditation, accountability, and community. 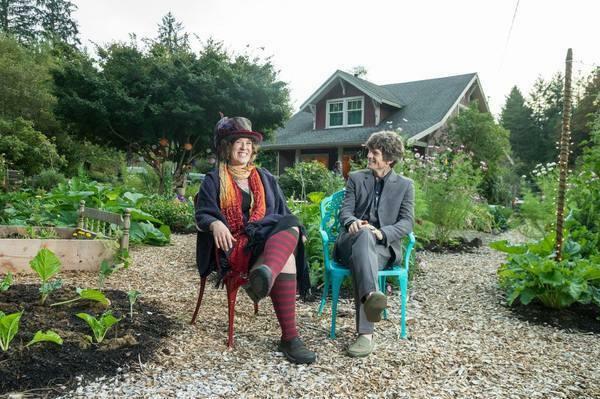 Ginger and I have spent the last 2 years burying ourselves in hard work to restore the Red Barn property into a new dream of a wellness retreat destination with sustainable/biodynamic food, herb, and tea production- NorthFork53 . It helps purchase more seeds and supplies to increase capital in the new year. For spring 2017 we are planning to recreate the 4 acres at NF53 with investments into herbal gardens, food production and planting camellia sinensis- the bush that creates tea varieties. Camellia takes about 4 years to start harvesting. This gives plenty of time to increase herbal production and perfect our blends. We will also be creating a meditation path around the 4 acre property surrounded with medicinal plants with their info for a peaceful educational walk. Guests will be able to take long walks with their tea in hand to learn about the fresh ingredients. There is only one other farm in the US growing camellia sinensis for large production. I feel it's a good time to create a business around making craft herbal tea blends here on the North Coast of Oregon. My goals are to work on my body, mind, and soul through gardening, meditation, and Amanae while sharing these practices with my community. Our biggest challenge is bringing our gardens out of dormancy, in between the growing seasons, and bringing life back into the land. We need help with cost for seed, compost, soil, marketing, tools, and maintenance. Providing healing practice, clean food and herbs has been a wonderful path for me to be on. It brings joy to my heart to be able to help others in our community to eat healthy, and be pain free. This loan will help with costs for purchasing seeds, building gardens beds and meditation paths and building our client base. It would be able to help catapult our farm into 2017 with the starting capitol we would need to help our community members live healthy through clean food, education, and holistic living practices. Why are you endorsing Brigham? Brigham is a dedicated and passionate soul helping build Oregon's North Coast food and wellness scene. His emphasis on herbs and teas is a perfect complement to our local food system, and also specifically a great component for North Fork 53, the project he runs with his wife. Brigham's farming skills combined with his herbal school training are a great background for developing this enterprise and his ability to partner with other producers will contribute greatly to his success. The Nehalem Valley Farm Trust is excited to have Brigham on the coast making our communities healthier and stronger.